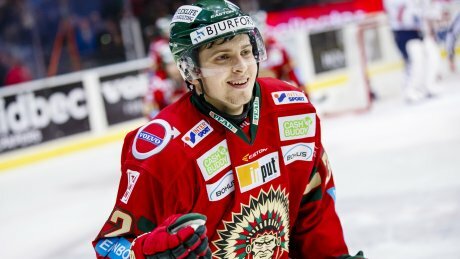 On Wednesday, April 27th, 2016, the Pittsburgh Penguins signed defenseman Lukas Bengtsson to a 2-year entry level contract. What he's done and where he's been can be found on the Pittsburgh Penguins website. The type of player he is, is ultimately in line with the Penguins' current philosophy, as Josh Khalfin (@Josh_Khalfin on Twitter) told me. First and foremost, Bengtsson is an excellent skater, something that is key to his game. The 5'10" defenseman is known for being able to start and sustain controlled breakouts due to his crisp passing, and his very high as well as noticeable hockey IQ aid him in these efforts. He isn't the best along the boards or being able to stay on the puck while being checked, but the right defense partner can act as a check for this unbalanced disadvantage, ultimately offsetting it. Winning puck battles and giving the puck to Bengtsson is a very reliable strategy to start breakouts, and should be used as much as possible of the possibility is there. In terms of the powerplay, Bengtsson is a natural quarterback. His knack for finding one-time opportunities is uncanny, and gets himself open rather easily for these situations. He likes to pinch on the powerplay when able, and forces the D back. A natural fit for Pittsburgh's system, as previously said. Lukas Bengtsson isn't a top-tier defenseman, but is in the 4th/5th range that can provide depth and actively sustain offensive pressure. Thanks for reading, and give @Josh_Khalfin a follow on Twitter!